Manzanita Lake is considered one of the pinnacles of stillwater fly fishing in California. 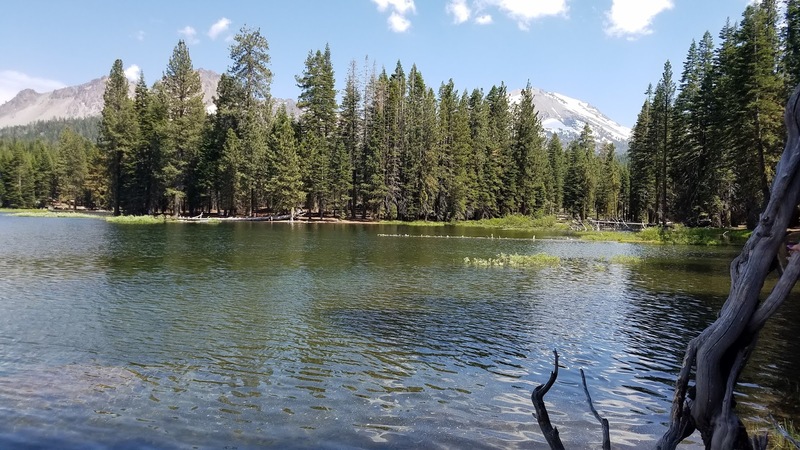 The small lake sits at 5,890ft elevation within the Lassen National Forest right below Mt. 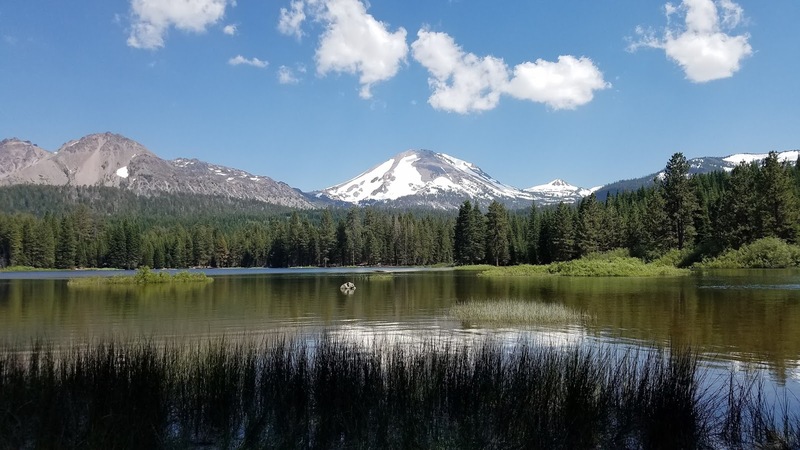 Lassen which can be observed and marveled at from afar. Many of the lakes around Mt. 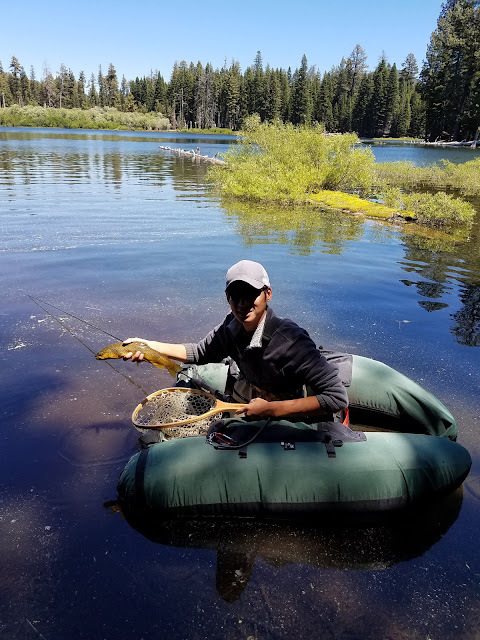 Lassen were stocked because the fish weren't able to spawn naturally due to the lack of spawning habitat. DFW have not stocked Lassen Park's lakes since the 1980s which makes all the fish found in the park wild. Manzanita Lake is unique in that it holds both wild brown and rainbow trout that are able to naturally spawn due to the inlet of Manzanita Creek. Reservations to camp at Manzanita Creek are often made several months in advance however there are plenty of walk-in campsites available during non-holiday weeks and weekends. The missus and I made reservations about two months ahead and were excited to visit, explore, and experience a new area within California. 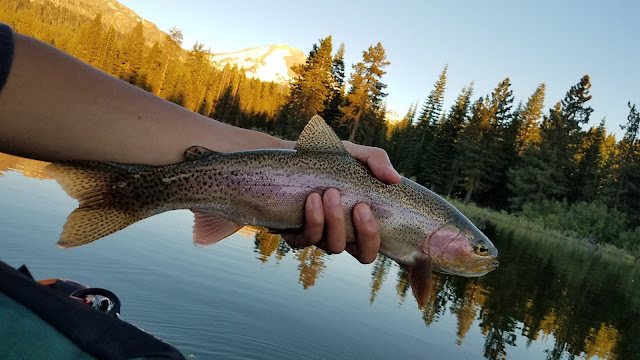 Manzanita Lake is the most beautiful lake I've ever fished. The gin clear water, aquatic and surrounding terrestrial plants, submerged trees, and a snow capped Mt. Lassen in the background makes for one hell of a scenic place to fish. I don't have a lot of experience fly fishing stillwaters so after scouting the lake during a hike I formulated a plan on how I wanted to approach my target. The first method I tried was stripping a bugger with a floating line while wading the banks. As soon as I got into the water I noticed that the lake was deceptively deep and nearly impossible to fish from the shore. Despite limited casting space I has able to get one take but nothing solid enough to set the hook. I didn't spend too much time wading the lake after that experience. Next I set out on my tube to explore the lake with an intermediate sinking line with two nymphs rigged and ready to go. I've never nymph fished a lake before so I spent most of the afternoon fishless. Once the sun went down I switched to a streamer set-up which I was much more confident in. 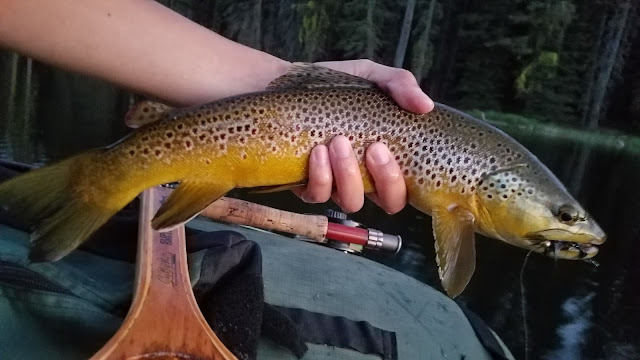 On the way back to my take out I pounded the banks with my streamer and was able to hook two nice browns before it got too dark. At this point I knew it was going to be a good trip. The following morning I set out at dawn around 5am. It was pretty chilly but the fish were still active and near the banks. I started with my streamer rig and was able to get a few takes but nothing solid. As the day warmed I noticed more activity above the surface but I couldn't make out what they were eating. There were tons of different bugs floating around the lake: ants, beetles, midges, spinners, you name it they were there. 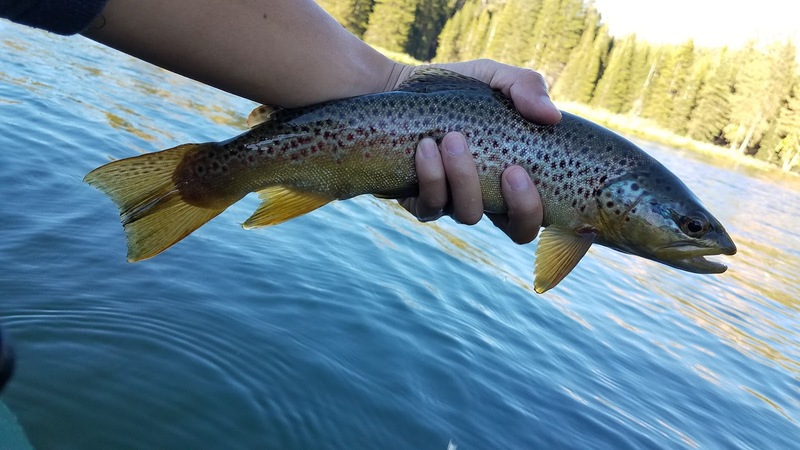 I switched between dry flies a few times and was finally able to raise a few cruisers. Nothing big except one that I was totally unprepared for but at least I knew how to get them on top. After the surface activity stopped I was met with an ultimatum, either learn how to fish nymphs or stop fishing. "Hey could you bring me my indicators, the balloon looking thingys, and my splitshots?" I radioed the missus. With an indicator rig in place I started experimenting with different patterns, depths, rigs, and retrieves. It wasn't long until I caught one fish, a second fish, and a third fish. I think I figured it out. I caught fish consistently for the rest of the trip. During each one of my outings I watched as many other anglers struggled. 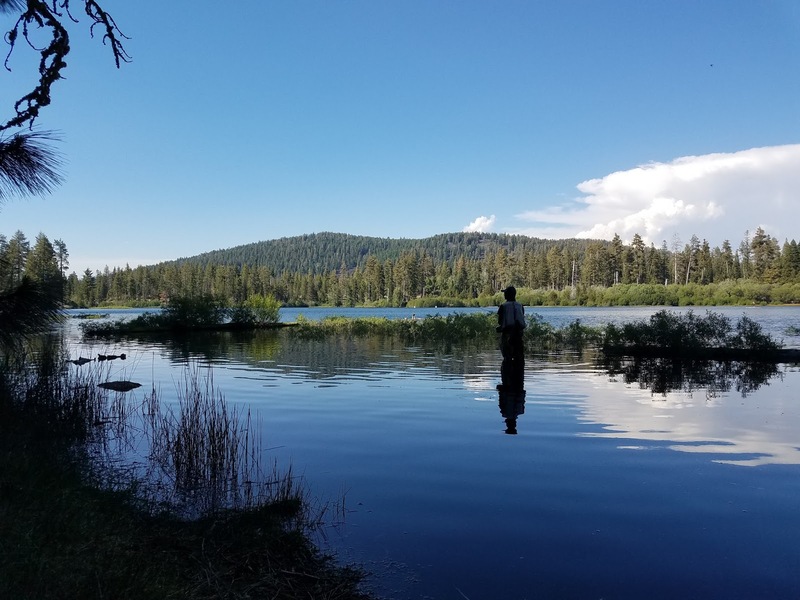 "This lake is a tough place to learn" explained a fly angler who had been fishing Manzanita for over thirty years. He reminisced a fond memory of watching a 20'' brown take his callibeatis dry right in front of him. "This lake just isn't what it use to be" he stated. During our brief conversation he reported that another angler had hooked and lost a fish-of-a-lifetime that looked 5-10#s. It's always good to hear that there are still some big fish in the lake and although I didn't hook any monsters it was definitely quality over quantity. I took some time to check out lower Manzanita Creek since it was open to fishing. The creek is surrounded by fallen trees and splits into several small cascading streams making it tough to fish. I caught a few small browns on dries but overall nothing too exciting. 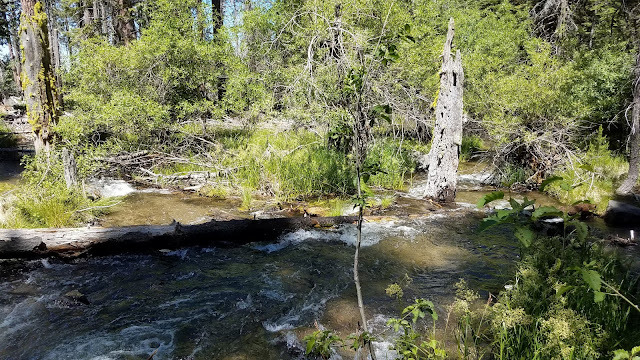 We also visited Burney Falls and explored the creek which was where I caught the fish of the trip in one of the most clearest and beautiful pools I had ever fished. It wasn't the biggest fish I caught during this trip but it was definitely the most thrilling. 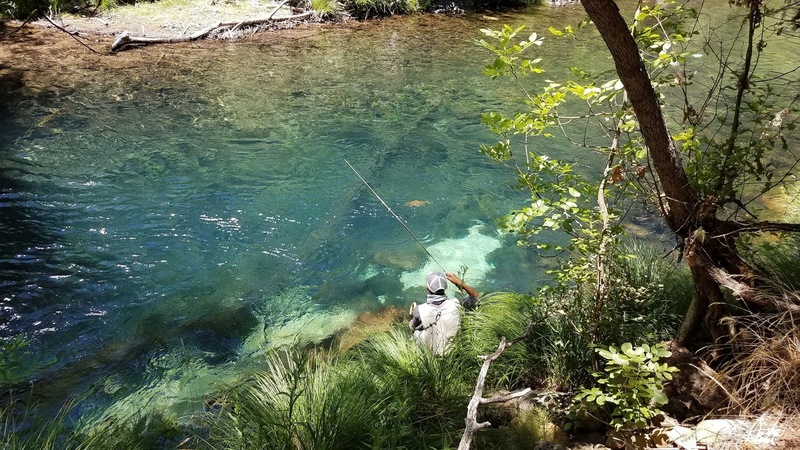 Emerald Burney Creek Pools - Fish On! Overall it was a great trip and I learned a lot about stillwater fly fishing. I am looking forward to my next visit to Manzanita Lake where I hope to catch the one that got away. Congratulations! I tried that lake last year but couldn't figure it out. I'm new to fly fishing lakes as well. Lakes are definitely a different ballgame and Manzanita Lake is the Superbowl of it all. Super tough but so rewarding. I hope your able to figure it out the next time you get out there. Manzanita Lake is by far the most beautiful place I've ever fished.